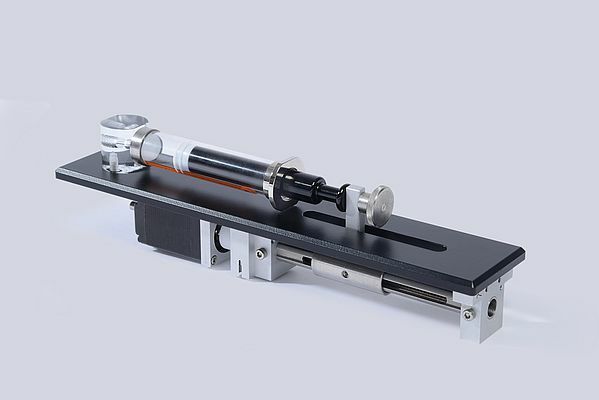 Spetec introduced the precision-SY OEM built-in syringe pump, developed for use in equipment where high precision in the microliter and nanoliter range is required when introducing samples or reagents. It matches the requirements of the analysis equipment, i.e. the shape and colour of the mounting plate are tailored to customer requirements. The core elements of the pumps are a stepper motor, a spindle, a linear guideway, a syringe holder and replaceable syringes. Thanks to the high stepper motor resolution of 25,600 steps per revolution, individual steps during the movement sequence are barely perceptible. A connecting element that forms a rigid connection between the spindle and the syringe plunger transmits the drive force from the stepper motor, thus delivering the feed motion for filling or emptying the syringe. Metering syringes with volumes between 0.05 ml and 10 ml are used. It is optionally available with our SMC01 controller.